Dynamic Duos Challenge #50 - Calypso Coral and Blushing Bride. For my card I used a Spellbinders Embossibilities folder. Inked up the inside with Calypso Coral. Then ran it through my Cuttlebug. 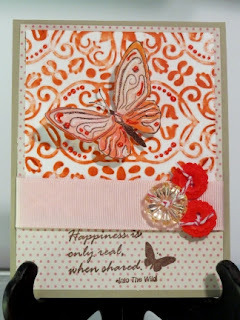 The butterfly and sentiment are from Unity Stamps SOTW club - Real Happiness Shared. I added some Ranger pearls and some buttons from SU and Mossy Made. Great color combo for those pastel lovers. Really pretty card..love the butterfly. Thanks for joining us this week at Dynamic Duos.